[Vsergeev] built an echo pedal for a guitar or with other audio manipulation applications. He used an mbed microcontroller for the project. You may remember Hackaday writer [Phil] labeling the mbed an ‘Arduino on steroids’, and it certainly handles this audio processing quite well. We’ve included a clip of the echo effect after the break. During the design process, [Vsergeev] used LTspice to simulate the analog circuitry and make things right before committing to the physical circuits. I see all these arduino projects, and I was wondering, would getting the arduino starter kit be a good idea to help me learn and understand basic programming? Ive been looking to buy one to help teach myself C and such. Sure. Arduinos are pretty friendly, the programming language is based on C, there’s lots of docs and tutorials on the Arduino web site and a huge user base. Shop around to get best price. Last time I bought a couple I ended up using iDuino, and they were about $20 apiece. 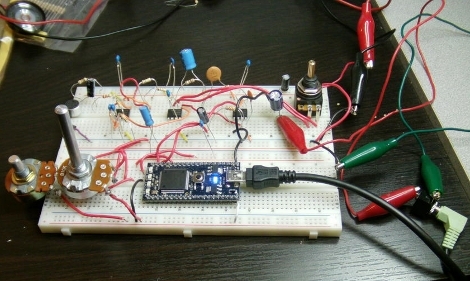 Basic soldering skills required, and you’ll need a small breadboard to prototype circuits on. By ‘basic’ programming did you mean simple programming, or BASIC programming as in the old Beginners All-purpose Symbolic Instruction Code? Because the only similarity C has to BASIC is the amount of similarity shared by *all* mainstream programming languages. If you want to learn BASIC, there might be better ways. I was talking about simple. Ive seen BASIC, but I thought C might be more fun. I learned Pascal first in school and promptly forgot all of it. Later in life, I taught myself Visual Basic. Right now, I’m teaching myself C++ (similar to C) and I have to say that I’m glad I learned the basics of programming by learning Visual Basic first, otherwise I would have been overwhelmed by C++ concepts. For instance, I thought it was much easier to learn pointers having had a solid background with arrays and such from Basic. Well, in my life, I have no programmer friends. only mechanics and moms. Nobody to teach me how to array… or shave as it would seem. Great work , i might pickup one of these for my capstone project. Seems like a really well rounded platform. The online editor has me a bit perturbed though , we’ll see. The second stage amplifier should probably be redesigned. Varying the feedback to change the gain also changed the bandwidth of the amplifier. In this case, his maximum gain is about 20.5dB. On that op-amp it corresponds to about a 100kHz cutoff. Functionally it will perform just fine since the cutoff is so high, however it’s not the way audio circuits are generally designed. Typically audio circuit have a fixed gain, but use a pot to attenuate either the input or output. C is great to learn arrays and pointers, which are great to understand low-level programming. C++ should not be your first object-oriented programming language (too complicated). Learn Java, Python, Ruby or C# first. The choice depends on which one best suits your tastes. most likely the cheaper and easier route to learn c would be visit the local thrift store or your closet and dust off a old pc and load a linux distro appropriate for the hardware. That way you can use the plethora of ansi c books out there and be able to easily debug your own work. If you want to play with some wires there is the parallel port and the easy to use parapin library. So that’s what he’ been doing with his time at MIT! Goofing around and playing guitar! You don’t need to but anything to learn programming (even embedded programming). You can use simulators and online tutorials to learn the basics. This will save you a whole headache of debugging hardware and software at the same time. If you want to do a hardware project, just buy a single controller for maybe £2 GBP and solder it onto a breadboard with a few LED’s and resistors. Pretty neat, but I wonder what the latency is? Would you get an ‘echo’ running dry? Great work :) Do you think it would be possible to build a guitar looper pedal (like the boss loop-station) using this board? Hey folks. Looks like you’re all having some fun. I built a guitar processor with an atmel 168. Boy am I ever having noise problems. I can hear a little hiss in the video above, but my problems sound like a war is going on. Tried everything–filtering input/output, shorter lead lengths, filter caps across VDD and VCC. Any ideas?